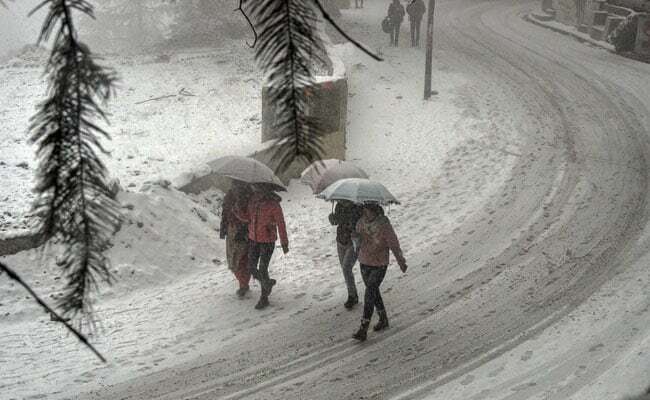 Popular tourist spots near Shimla like Kufri, Chail and Narkanda saw the night temperatures close to below zero degree Celsius. Most parts of Himachal Pradesh saw an intense cold wave, today, with Kalpa and Keylong towns seeing more snowfall. The resort town of Kalpa, some 250 km from the state capital saw mild snow and experienced a low of minus 3.8 degrees Celsius, while it was minus 10 degrees in Keylong in Lahaul-Spiti district with a snowfall of 3 cm. "The night temperature of Shimla fell by 3.8 degrees from yesterday's 7 degrees," a weather official told IANS. Vehicular traffic was disrupted in Kinnaur district after snowfall. It was minus 0.6 degrees in Manali, while it was 4.4 degrees in Dharamsala and 1.7 degrees in Dalhousie. The Rohtang Pass (13,050 feet) and the Baralacha Pass (16,020 ft) located on the Manali-Leh highway experienced heavy snowfall. Met officials said the entire tribal belt in Kinnaur, Lahaul and Spiti, Kullu and Chamba districts had witnessed snowfall since Wednesday. The weather forecast said the western disturbances - storm systems originating from Caspian Sea in the Central Asia and moving across the Afghanistan-Pakistan region - had almost receded from the region and the weather would mainly remain dry in the next few days. A fresh western disturbance is likely to affect the western Himalayan region with chances of rain and snow on January 20 and 21.